To our clients, colleagues, partners and friends who are off to enjoy their holidays – we wish you a safe, restful and rewarding break. See you in the new year! 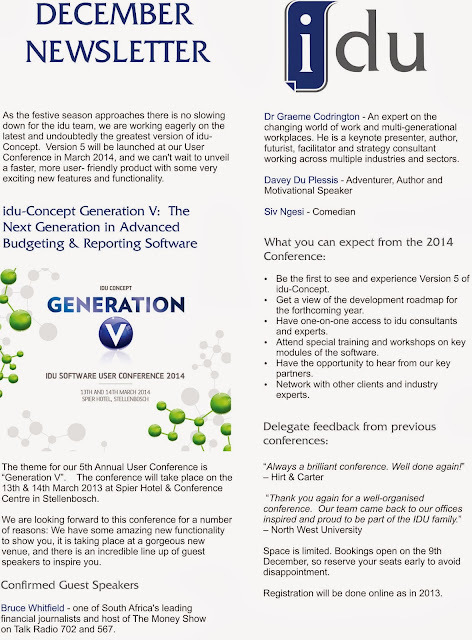 Registration is now open for the idu User Conference 2014! 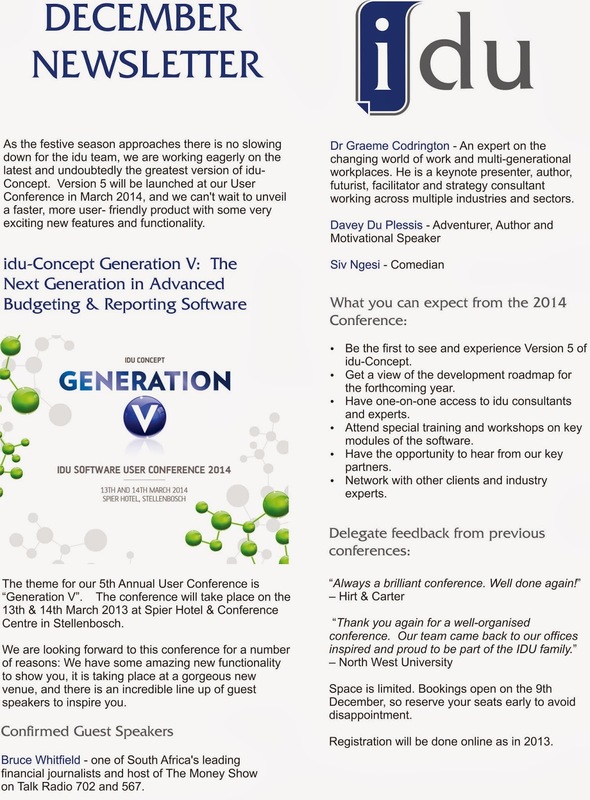 This conference is one not to be missed, as we will be launching Version 5 of idu-Concept. * Be the first to see and experience Version 5 of idu-Concept, packed with amazing new features and functionality. 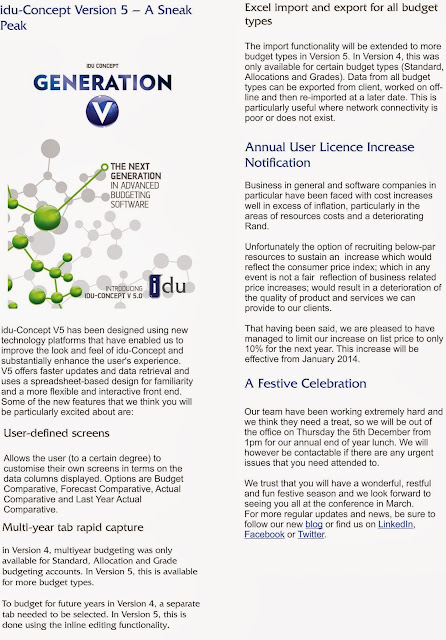 * Get a view of the development roadmap for the forthcoming year. * Have one-on-one access to idu consultants and experts. * Be inspired, educated and entertained by our amazing line-up of guest speakers. * Attend special training and workshops on key modules of the software. * Have the opportunity to hear from our key partners Sage and NetTreasury. * Network with other clients and industry experts. To register for you or your team please click here. Space is limited so reserve your seats early to avoid disappointment. Registration closes on the 14th February 2014. "Always a brilliant conference. Well done again!" "Thank you for having me at your conference, I enjoyed it very much as it was such an eye opener and brilliantly organised"
"Thank you again for a well-organised conference. Our team came back to our offices inspired and proud to be a part of the IDU family"
If you require any additional information please do not hesitate to contact rochelle@idu.co.za. People across generations, countries, races, religions and creeds have all been experiencing Mandela’s passing in their own way. There has been an outpouring of respect, grief and remembrances across every communications channel across the globe. There have been stories from those who were a part of the struggle, who lived through that era and watched Mandela’s release and felt the waves of change crash over the country. There has been whispered memories from those who were children when this happened, who felt the changes as rumbles through their parents and saw the introduction of new faces of all races to their schools and grew up with friends and families of mixed races and silently knew in the deepest part of them that this was because of a great man named Mandela. And then there is the generation who have never known a world without the changes Mandela brought about – this was the generation that Mandela fought for, a generation that has no living memory of their own of separation and segregation. Mandela taught us that without forgiveness, freedom is nothing - instead of becoming angry and seeking revenge on those that treated him as “less than” his whole life, he realised he had to let go of it or he would remain a prisoner - something many of today’s leaders, and every one of us, could stand to learn. Since 2008, people across the world have celebrated Nelson Mandela International Day (or Mandela Day) on the 18th of July, his birthday. This day celebrates the idea that every single person has the power to make an impact and change the world in unprecedented ways; Mandela was the proof of this. I believe that the best way to honour the memory of this great man and everything he did, is to live every day as if it were Mandela Day. He left us with so many lessons on how to be better, on how to lead, on how to bring about change through powerful belief, informed ideas and positive action; I believe it is our responsibility to aspire to live our lives in line with all he taught us and to continue to share his legacy by leading by example as he did for so long. The world is so much richer for having had you in it and remains rich even in your passing, because of the abundance of all you have left behind. Farewell Madiba. Moving into the cloud is a daunting prospect for many businesses; even more so when dealing with sensitive financial information. One of the main reasons for this seems to be fear around security and increased risk. Years ago, transitioning from traditional paper practices to IT solutions raised many of the same fears and yet, look at the advantages it provided: flagging and alerts of discrepancies, from customer payments lagging to sudden increases in expenditure or exceeding budgets; simplifying information to be understood by anyone leaving less place to hide fraud; and real-time access to information. If fear is holding you back, you should know that one of the greatest benefits of cloud is handing some of your risk over to experts who are better able to protect your data than you are. Cost is always a priority, so let’s look at investment risk. With cloud, there is no large upfront cost, no need for internal specialists or maintenance, and most solutions are easily scalable, allowing you to add or remove users as needed. Cloud also provides access to unlimited storage at a much lower cost than extending your own hardware would. When you own the infrastructure, it is your responsibility to get professionals to continually test and fix any security risks. 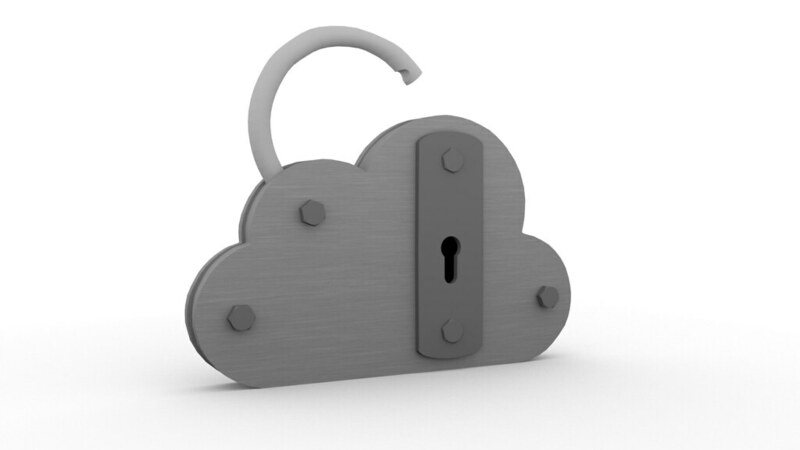 Cloud providers employ security specialists; providing the highest level of service at no extra cost and your software is automatically updated and secure. On the topic of automatic updates - software integrations, customisations, fixes and even additional products and features can be implemented without any disruption to your business. Having everything up to date decreases all your risks, and this automation also minimises the need for staff to do unapproved updates and downloads which open your systems to potential risk through viruses and malware. Cloud services have many benefits, including those that will support your company’s risk management planning, so don’t let fear cloud your judgment. With your provider covering so much of your risk, it frees you up to spend your time on developing and growing your business. Cape Union Mart Group is based in Cape Town and currently houses 5 major local brands - Cape Union Mart, South Africa’s favourite outdoor store and the group’s flagship brand; K-Way, an extremely popular technical range of outdoor clothing and gear; Old Khaki, a casual fashion brand available in over a dozen stand-alone stores; Sparks and Ellis, a uniform company and the latest addition Poetry, an eclectic lifestyle concept store for women. Stocking everything one needs for outdoor pursuits since 1933, Cape Union Mart has over 100 stores across South Africa, Namibia and Botswana. In 2011 Cape Union Mart embarked on a massive project, revamping their entire financial and POS systems. “One of the key elements we needed to review was our budgeting and reporting systems. We had been carrying out our budgeting in Excel which became a time-consuming and labour-intensive exercise that was often complicated further by mistakes caused by human error or poor version control,” says Evan Torrance, IT Director of Cape Union Mart. Cape Union Mart considers idu Software’s flexibility as a key differentiator of the company. There was a degree of complexity involved in the roll-out and on-going support required because of an ERP roll-out that was taking place at a similar point in time. “The idu team was always pleasant, professional and accommodating, and approached any and all additional support with a can-do attitude,” says Torrance. Cape Union Mart began using three idu-Concept modules – Budgeting, Reporting & Analytics – in late 2011. They were instantly impressed by the accuracy, real-time transparency and the control it provided. Users of the systems include everyone from the Financial Director, financial managers, department heads, area managers and selected departmental users and the feedback has been consistently that they are easy to use and make the work faster and simpler to do. The idu Concept Financial Budgeting Module made the process of loading budgets on an annual basis far smoother and more efficient. Previously there were issues with multiple versions of the budget across different departments and they were often poorly consolidated or late for the new financial year. The simplicity and accuracy of a real time system has eliminated all of these concerns. The idu-Concept Analytics module has streamlined the monthly reporting process and makes analysing data faster, easier and more accurate. The fact that is reads data from the idu modules and the ERP systems makes reporting of varied and complex data easy.